This work proposes that doodling can provide a gateway into the subconscious. The title references the psychoanalytical technique of active imagination. The installation addresses the divide between external and internal realities. 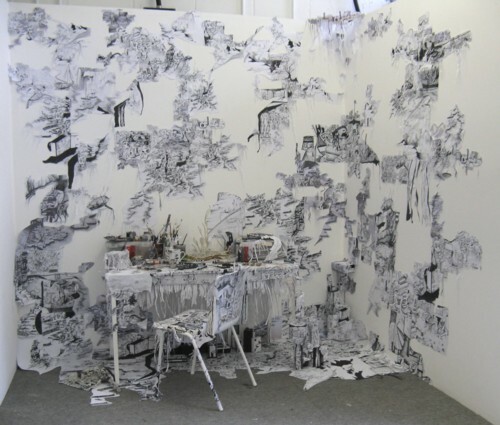 It contrasts the studio environment, with a fantastical landscape, conceived as a map of thinking and a trace of the artist’s fragmented thought processes over the year. The work also explores the status of language against drawing and what actually occurs in the mind. The work relies heavily upon the viewer’s interaction, aiming to facilitate imaginings and speculation. Viewers are encouraged to construct their own meaning from the ambiguous imagery, which implies a narrative that is never told.